If you have trouble with the thread unraveling from your embroidery thread cones, you'll want to check out our thread nets! 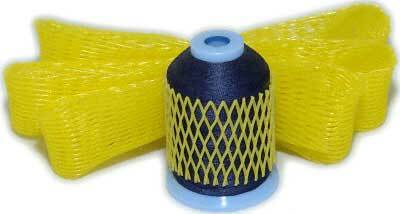 Made from a stretchable plastic mesh, these nets will accommodate embroidery thread spools from about 3/4" to 3" in diameter. For use only when storing thread; remove before using the thread with your machine. Sold by the yard so you can cut pieces to the length that's right for you - usually about 2" is plenty, so 1 yard will yield enough thread net for about 18 spools. Robison-Anton introduced the new "Snap Spool" base to solve this problem -- the lower portion of the spool base snaps open when you pull on it, and you can pinch the free end of the thread spool in the base when you snap it back closed!